For affordable landscape maintenance services in the Memphis, Germantown, Cordova, Collierville, Bartlett, Lakeland and the Arlington Tennessee area call Roper Lawn & Landscape. It doesn’t get much better than enjoying a cup of coffee while watching your flower garden in the morning sunlight. But how can you guarantee that your plants are receiving the care that they need? Most people think that flowerbed maintenance means only giving plants enough water. Unfortunately, most flowers require much more attention than that! If your flowerbeds aren’t looking their best, then you need to call Roper Lawn & Landscape for your flowerbeds. We offer the best in Memphis, TN, yard care solutions, as well as the best pricing possible. Whether your flowers need weed removal services,plant trimming, soil nutrition and more, we offer complete landscaping solutions for less. 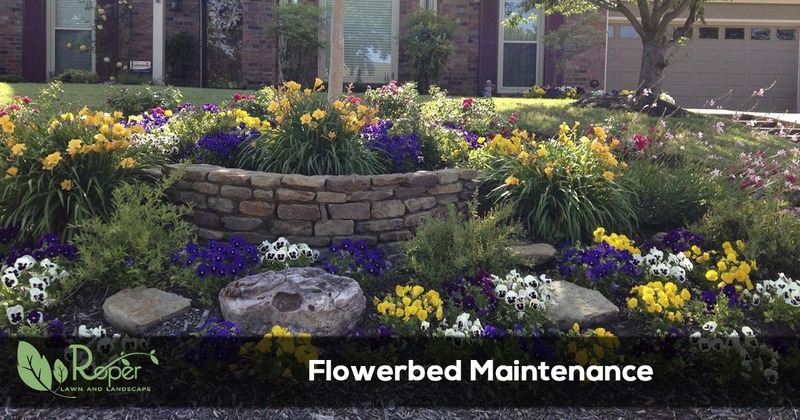 Call today for your best flowerbed maintenance services and see the difference! Flowerbeds require different care techniques than grass does. Flowers are more delicate than most other plants, and a simple mistake can have devastating results. Some flowers grow all year round, while annuals only last a few seasons before they need to get replaced. Whichever type of plants is best for your home, our team has the experience you need to care for them. We have solutions that help protect your flowerbeds from invasive weeds, overgrowth, and other common hazards. When other companies ignore your prettiest plants, we give your entire yard the attention it deserves! Call today for your local flower experts. We make the most of any flowerbeds each time! When hiring landscaping companies, most people decide to handle their flowers themselves. Unfortunately, that often doesn’t create the best results. Many yard care companies use the same herbicide throughout your yard. Which means when your flowers have weeds spring up, they’re getting hit with the same products! Other service providers merely ignore flowerbeds because they just handle grass cutting. Why should you spend a fortune each month to skip past your flowerbeds? Instead, our team offers dedicated solutions to all your lawn care needs. We provide better monthly landscaping and the best flower care services than anyone else in the community! Call today for your best flowerbed maintenance services. We guarantee better flowers for less when you hire us! Most people don’t realize that the soil composition in the greater Memphis area is highly acidic. As a result, only certain types of plants, flowers, and grass can grow without drastically treating the soil. That means that merely installing new plants and hoping for the best isn’t going to end well. And yet, asking many landscapers to treat flowerbeds end up that way. Instead, you need a landscaper with the experience you can trust for all your yard care needs. We know how to treat your lawn best to achieve the results you deserve. If you aren’t hiring us for your landscaping services, you aren’t receiving the level of dedication that you need. Call Roper Lawn & Landscape today for your best lawn care and flower maintenance options! Ready to schedule your flowerbed maintenance services or just need to get a quote? Give us a call at 901-290-8165 or request a quote online. We give quotes fast and make scheduling easy.